Today we reviewed Night Thrasher, leader of the New Warriors. But did you know that's not the only team he was ever a part of? Night Thrasher was introduced, along with the rest of the New Warriors, in 1989's Thor #411 (and on the cover of the next issue). However, an old Spider-Man villain known as The Rocket Racer had just been brought back as something of an ally a few months before, meaning that there were now two nearly identical characters running around: Marvel's entire list of black heroes was, like, Luke Cage, Storm, Black Panther, Monica Rambeau, Falcon, Battlestar... and then two unrelated guys with skateboards. Editor Dwayne McDuffie (the same dude who had to explain why it wasn't a great idea to keep calling Captain America's new black sidekick "Bucky") took issue with this, and found a way to smartly deal with it: by pitching a new book. When a group of teen-aged negroes find cosmic-powered skateboards, their lives are forever changed! A team of distinct characters join together, swearing an oath to use their powers for good. ROCKET RACER: A black guy on a skateboard. 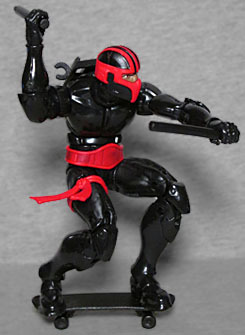 NIGHT THRASHER: A black guy on a skateboard. DARK WHEELIE: A black guy on a skateboard. And their leader, the mysterious black guy on a skateboard known only as "that mysterious black guy on a skateboard." They have an attractive, white female friend to calm them down when they get too excited. Face it Pilgrim, this one's got it all!!!! If nothing else, he at least made enough of a point that Marvel didn't introduce any more black guys with skateboards. And for his part, McDuffie launched Milestone Comics a few years later, an imprint which introduced only one character who did anything that looked like skateboarding. This entry was posted in addendums, lists, Marvel, videos and tagged Marvel Legends, Spider-Man. Bookmark the permalink.